I’m all about meals you make once and can eat for several days in a row, especially for lunch. 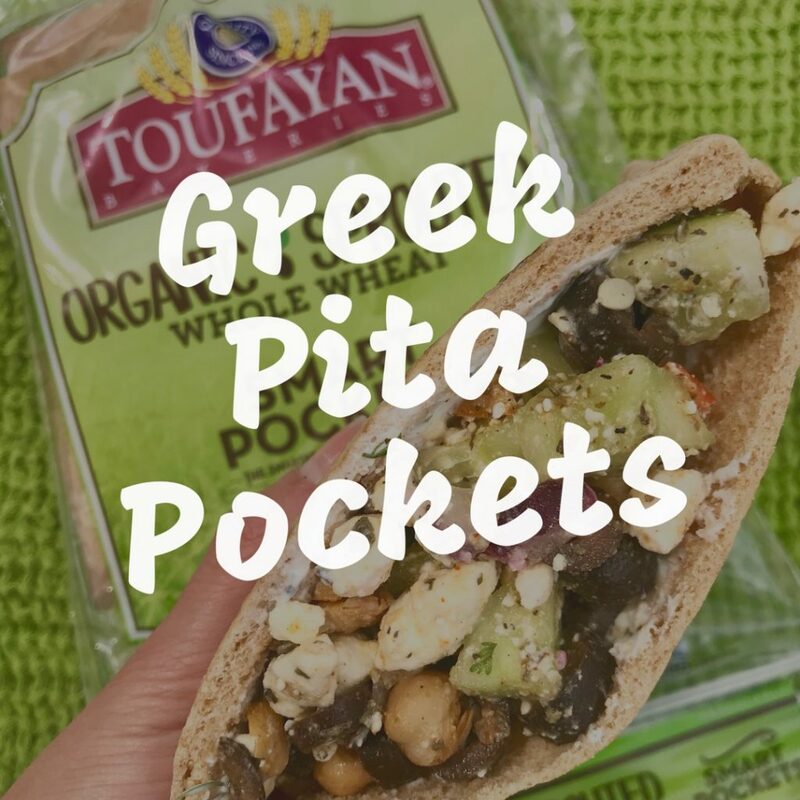 These Greek Pita Pockets may not photograph well but they sure hit the spot when lunchtime rolls around. No microwave required. You can make the tzatziki dip yourself or pick up a pre-made one. 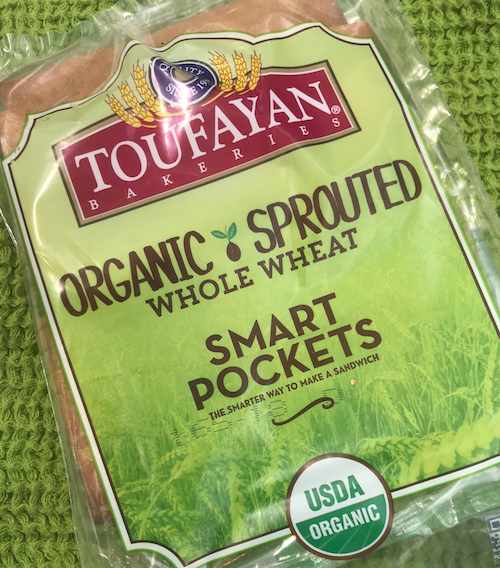 I found these new sprouted smart pockets at Publix, but you can use any kind of whole grain pita or naan bread as a base. Why did I use sprouted grain? The best type of grain-based products you can buy are sprouted, also known as “ezekiel.” You’ve probably seen or heard of ezekiel bread or ezekiel cereal before. In these products, the entire grain kernel is sprouted before being baked, which boosts the protein content. You can find sprouted english muffins, pizza crusts and more. They can be made from a variety of grains and legumes and are often less processed then other bread products and have less added sugars and sweeteners. 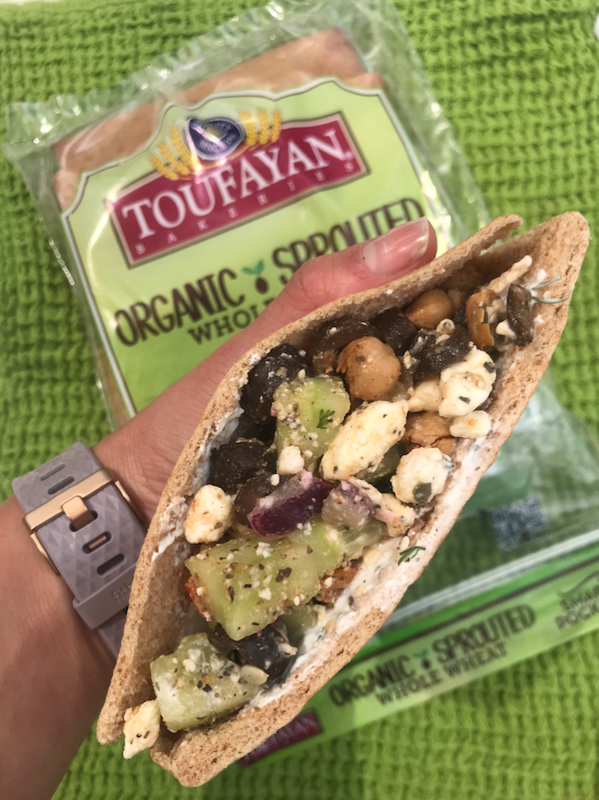 The protein boost from the sprouted grains will help keep you satisfied when using it as a base for toast or a vegetable-based pita pocket like this recipe, every gram of protein helps. Most sprouted or ezekiel products avoid using preservatives, so keep them in the refrigerator or freezer to make them last longer. In a medium sized bowl, combine all of the above ingredients (except pita pockets). Mix all the ingredients well and keep refrigerated. If you’re packing this for lunch, keep the filling, tzatziki sauce, and pockets separate until you are ready to eat or they will get soggy. Line the pocket with tzatziki and fill with the veggie mix.